The Quadcopter Syma X8C with camera looks pro, but doesn’t come with a pro price. This quad has an attractive white casing, with red, white and blue stripes. There is also a sleek black casing with yellow and red stripes. Its remote controller has four channels and 2.4GHz technology. There are some great features that should please most beginners, and a few seasoned flight pros when they see the Syma X8C in action. It’s a great compromise when you can’t afford the DJI Phantom, but don’t expect any fancy GPS system at this price point of under $90. Most drones nowadays are expected to have a six axis gyro, otherwise they get categorized as “toys”. The quadcopter Syma X8C has a six axis gyro stabilizer. There is a 3D lock, and longer flight times. Tricks are an important part of the quadcopter experience, and the Syma X8C can perform a 360 degree eversion. You can even do a continuous roll for added fun. Cool LED running lights are installed at the base of each of the four rotors. These lights will help you determine the forward facing orientation while in the air, unless you’re in headless mode. They are also fun to see in the dark, while you’re flying at night. Sometimes you want to toss the rules to the wind, and that’s why the Syma X8C also has a headless mode. This is also known as an “intelligent orientation” system. The IOC function enables you to fly it with or without, in a headless mode, so you don’t need to figure out where the nose direction is. You can enable it, and not have to worry about whether the nose is facing backwards or forwards. The drone will fly in the direction that you point the controls on the remote controller. Four white blade protectors will protect the blades while in flight. You never know when you may run into a tree, wall, or furniture. Your blades will have a longer life, avoiding being bent or warped from collisions. The white plastic protective circles are made from an elasticized material that protects the rotors and prevents them from prematurely wearing out. You can protect your quad from falls, crashes, and collisions. If you should cause some damage, there are many parts that can be ordered for replacement. The rotors are one of first items that you’ll consider replacing. 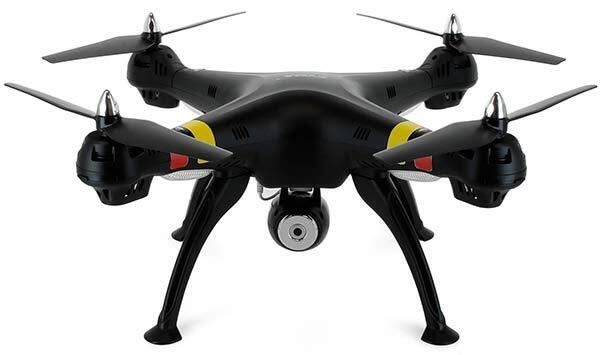 The Syma X8C is equipped with a built-in camera that has been installed underneath the body of the drone. It’s an HD camera that can take still images and video of the surrounding scenery, as it soars through the air. This camera is equipped with a wide angle lens,which is perfect for all-purpose scenic filming. But at this price, don’t expect to be able to remotely control the camera angle. The Syma radio controller has a different look to it than most other quadcopter’s radio controllers. This one is available in a white plastic box casing, with bright red highlighted controls. It has the antenna on top, with two smaller left and right control levers. There are fine tuning buttons located underneath, and a power on and off button in the middle. The headless function and eversion switches are located on the top sides of the unit. The photo and video buttons and the back and front trim buttons are to each side of the on/off switch. There is also an indicator light on the front. The Syma X8C has a 7.4 volt 2000 Mah Li-poly rechargeable battery. It takes about 200 minutes to get it fully charged up. After one full charge you’ll have approximately seven minutes of enjoyable drone flight time, before needing to bring it back in for a recharge. You may wish to purchase additional battery packs so you can extend your flight time on the field. The quadcopter Syma X8C measures 50 cm by 50 cm and 19 centimeters tall. The battery for the controller requires four double A 1.5 volt batteries. It weighs about three pounds in total. Inside the white rectangular box you’ll receive one Syma X8C quadcopter, a USB charging cord, instruction manual, camera, and remote control unit. You’ll need to supply your own batteries. There are smaller accessories included: the camera card reader, memory card, four riggers, 4 blades, and a small screwdriver. When choosing your next Syma, you can watch the informative and fun videos on their website. They also have a news release tab so you can check out the latest toy fair releases. If you need support, you can go to their support tab to download the manual for the Syma X8C quadcopter. You may also contact Syma Technology Co., Limited through email support. If you’ve been searching for a quadcopter that has a camera for an affordable price, you’ll be pleased with the quadcopter Syma X8C. It has a great camera onboard, and does some nifty tricks that should please your other drone-enthusiast friends. Many people will compare this drone to the DJI Phantom — it’s not a toy, but it’s not pro-level either. It also takes a frustratingly long time to charge up, so the flight enthusiast may consider buying a few extra rechargeable batteries. But best of all, this drone looks pro enough on the flying field, so you won’t be laughed back to the car.